Microsoft is a huge company, operating in an astoundingly broad range of business segments, including the Windows operating systems for PCs, servers and development tools, business Office suites, online information and services (Live to MSN), and entertainment and devices (Xbox to Zune to automotive). Oh, and there's also the Microsoft Hardware product line -- not even visible in the summary above. But Microsoft has some clever designers working on hardware, creating some rather innovative products, including mice and keyboards, webcams and headsets, and other gaming and notebook accessories. For example, the Microsoft Arc Mouse looks at first glance like something you might have brainstormed on the back of a napkin -- "Hey, let's make a mouse that folds up on itself for travel." But after some serious design and engineering development, the idea has been realized in an attractive and compelling design. When open, the Arc Mouse forms a smooth arc so you can rest your hand comfortably. (Actually, the back half drops away at a sharp angle so less of the palm rests on the surface than with other mice.) The mouse has a scroll wheel, plus a scroll wheel button and side button on the right. But the real trick is the crease down the middle -- a solid hinge that lets you fold up the tail end of the mouse to reduce it to about 3/5 of the full length, about 3 x 2 1/4 x 1 inch. The Arc Mouse uses 2.4 GHz wireless technology, so it configures automatically with the included USB micro-transceiver. For travel, the tiny transceiver tucks away in a slot under the mouse, snapping into place magnetically, which then is protected when you close up the mouse. 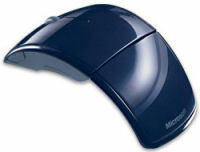 The Microsoft Arc Mouse is available for $49, in a variety of colors (with new Special Edition flavors). This entry posted on November 8, 2009. Previous: Marc-Antoine Goulard -- "Almost Recognizable". Next: Microsoft Bluetooth Mobile Keyboard -- Curvy and Sleek.